For other uses, see Dust devil (disambiguation). Primarily temperate and tropical regions. Dust and debris lofted into air, possibly wind damage. They are comparable to tornadoes in that both are a weather phenomenon involving a vertically oriented rotating column of wind. Most tornadoes are associated with a larger parent circulation, the mesocyclone on the back of a supercell thunderstorm. Dust devils form as a swirling updraft under sunny conditions during fair weather, rarely coming close to the intensity of a tornado. Dust devils form when a pocket of hot air near the surface rises quickly through cooler air above it, forming an updraft. If conditions are just right, the updraft may begin to rotate. As the air rapidly rises, the column of hot air is stretched vertically, thereby moving mass closer to the axis of rotation, which causes intensification of the spinning effect by conservation of angular momentum. The secondary flow in the dust devil causes other hot air to speed horizontally inward to the bottom of the newly forming vortex. As more hot air rushes in toward the developing vortex to replace the air that is rising, the spinning effect becomes further intensified and self-sustaining. 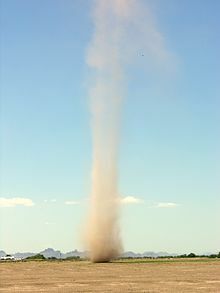 A dust devil, fully formed, is a funnel-like chimney through which hot air moves, both upwards and in a circle. As the hot air rises, it cools, loses its buoyancy and eventually ceases to rise. As it rises, it displaces air which descends outside the core of the vortex. This cool air returning acts as a balance against the spinning hot-air outer wall and keeps the system stable. The spinning effect, along with surface friction, usually will produce a forward momentum. The dust devil is able to sustain itself longer by moving over nearby sources of hot surface air. As available hot air near the surface is channeled up the dust devil, eventually surrounding cooler air will be sucked in. Once this occurs, the effect is dramatic, and the dust devil dissipates in seconds. Usually this occurs when the dust devil is not moving fast enough (depletion) or begins to enter a terrain where the surface temperatures are cooler. Certain conditions increase the likelihood of dust devil formation. Flat barren terrain, desert or tarmac: Flat conditions increase the likelihood of the hot-air "fuel" being a near constant. Dusty or sandy conditions will cause particles to become caught up in the vortex, making the dust devil easily visible, but are not necessary for the formation of the vortex. Clear skies or lightly cloudy conditions: The surface needs to absorb significant amounts of solar energy to heat the air near the surface and create ideal dust devil conditions. Light or no wind and cool atmospheric temperature: The underlying factor for sustainability of a dust devil is the extreme difference in temperature between the near-surface air and the atmosphere. Windy conditions will destabilize the spinning effect of a dust devil. On Earth, many dust devils are usually small and weak, often less than 3 feet (0.9 m) in diameter with maximum winds averaging about 45 miles per hour (70 km/h), and they often dissipate less than a minute after forming. On rare occasions, a dust devil can grow very large and intense, sometimes reaching a diameter of up to 300 feet (90 m) with winds in excess of 60 mph (100 km/h+) and can last for upwards of 20 minutes before dissipating. Dust devils typically do not cause injuries, but rare, severe dust devils have caused damage and even deaths in the past. One such dust devil struck the Coconino County Fairgrounds in Flagstaff, Arizona, on September 14, 2000, causing extensive damage to several temporary tents, stands and booths, as well as some permanent fairgrounds structures. Several injuries were reported, but there were no fatalities. Based on the degree of damage left behind, it is estimated that the dust devil produced winds as high as 75 mph (120 km/h), which is equivalent to an EF-0 tornado. On May 19, 2003, a dust devil lifted the roof off a two-story building in Lebanon, Maine, causing it to collapse and kill a man inside. In East El Paso, Texas in 2010, three children in an inflatable jump house were picked up by a dust devil and lifted over 10 feet (3 m), traveling over a fence and landing in a backyard three houses away. In Commerce City, Colorado in 2018, a powerful dust devil hurtled two porta-potties into the air. No one was injured in the incident. In 2019 a large dust devil in Yucheng county, Henan province, China killed 2 children and injured 18 children and 2 adults when a bouncy castle was lifted into the air. Dust devils have been implicated in around 100 aircraft accidents. While many incidents have been simple taxiing problems, a few have had fatal consequences. Dust devils are also considered major hazards among skydivers and paragliding pilots as they can cause a parachute or a glider to collapse with little to no warning, at altitudes considered too low to cut away, and contribute to the serious injury or death of parachutists. There is an endemic disease in some arid areas, such as the southwestern United States, California, northwestern Mexico, Central America, and South America, called Valley fever. “Cocci” fungus grows naturally in alkaline soil and the fungus spores that lie dormant and can be picked up by dust devils, are blown around. When a person or animal breathes these spores in, they cause fungal pneumonia. While usually not a serious threat, this disease is still dangerous to some people and animals, especially if they are old or young. Dust devils, even small ones (on Earth), can produce radio noise and electrical fields greater than 10,000 volts per meter. A dust devil picks up small dirt and dust particles. As the particles whirl around, they bump and scrape into each other and become electrically charged. The whirling charged particles also create a magnetic field that fluctuates between 3 and 30 times each second. These electric fields may assist the vortices in lifting material off the ground and into the atmosphere. Field experiments indicate that a dust devil can lift 1 gram of dust per second from each square metre (10 lb/s from each acre) of ground over which it passes. A large dust devil measuring about 100 metres (330 ft) across at its base can lift about 15 metric tonnes (17 short tons) of dust into the air in 30 minutes. Giant dust storms that sweep across the world's deserts contribute 8% of the mineral dust in the atmosphere each year during the handful of storms that occur. In comparison, the significantly smaller dust devils that twist across the deserts during the summer lift about three times as much dust, thus having a greater combined impact on the dust content of the atmosphere. When this occurs, they are often called sand pillars. 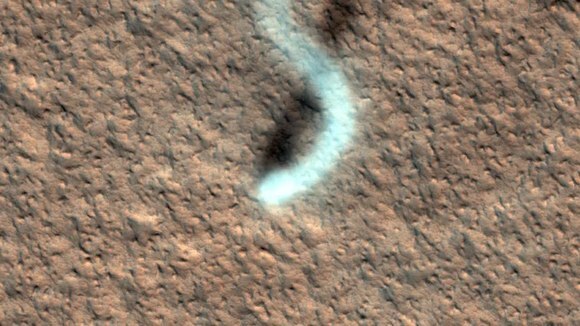 Dust devils also occur on Mars (see dust devil tracks) and were first photographed by the Viking orbiters in the 1970s. In 1997, the Mars Pathfinder lander detected a dust devil passing over it. In the image shown here, photographed by the Mars Global Surveyor, the long dark streak is formed by a moving swirling column of Martian atmosphere. The dust devil itself (the black spot) is climbing the crater wall. The streaks on the right are sand dunes on the crater floor. Martian dust devils can be up to fifty times as wide and ten times as high as terrestrial dust devils, and large ones may pose a threat to terrestrial technology sent to Mars. On 7 November 2016, five such dust devils ranging in heights of 0.5 to 1.9 km were imaged in a single observation by Mars Orbiter Mission in martian southern hemisphere. Mission members monitoring the Spirit rover on Mars reported on March 12, 2005, that a lucky encounter with a dust devil had cleaned the solar panels of that robot. Power levels dramatically increased and daily science work was anticipated to be expanded. A similar phenomenon (solar panels mysteriously cleaned of accumulated dust) had previously been observed with the Opportunity rover, and dust devils had also been suspected as the cause. A dust devil on hilly terrain in the Amazonis quadrangle. Dust devil on Mars, photographed by the Mars rover Spirit. The counter in the bottom-left corner indicates time in seconds after the first photo was taken in the sequence. At the final frames, a trail is visible on the Martian surface. Three other dust devils also appear in the background. The Serpent Dust Devil of Mars - video (01:16). Snow whirlwind, similar to a dust devil, seen on Mount Royal in Montreal, Quebec, Canada. A fire whirl or swirl, sometimes called fire devils or fire tornadoes, can be seen during intense fires in combustible building structures or, more commonly, in forest or bush fires. A fire whirl is a vortex-shaped formation of burning gases being released from the combustible material. The genesis of the vortex is probably similar to that of a dust devil. As distinct from the dust devil, it is improbable that the height reached by the fire gas vortex is greater than the visible height of the vertical flames because of turbulence in the surrounding gases that inhibit creation of a stable boundary layer between the rotating/rising gases relative to the surrounding gases. Hot cinders underneath freshly deposited ash in recently burned areas may sometimes generate numerous dust devils. The lighter weight and the darker color of the ash may create dust devils that are visible hundreds of feet into the air. Ash devils form similar to dust devils and are often seen on unstable days in burn scar areas of recent fires. Steam devils are phenomena often observed in the steam rising from power plants. The same conditions can produce a snow whirlwind, although differential heating is more difficult in snow-covered areas. Coal devils are common at the coal town of Tsagaan Khad in South Gobi Province, Mongolia. They occur when dust devils pick up large amounts of stockpiled coal. Their dark color makes them resemble some tornados. ^ Glossary of Meteorology. American Meteorological Society. 2000. ISBN 978-1-878220-34-9. Archived from the original on 2009-01-30. ^ Ludlum, David M. (1997). National Audubon Society Field Guide to North American Weather. Knopf. ISBN 978-0-679-40851-2. ^ "Dust Devils: Ephemeral Whirlwinds Can Stir Up Trouble". Arizona Vacation Planner. Archived from the original on 2012-07-18. Retrieved 2007-10-05. ^ "Damage From a Dust Devil at the Coconino County Fairgrounds - September 14, 2000". National Weather Service-Flagstaff, AZ. Retrieved 2007-10-05. ^ NCDC: Event Details Archived 2009-01-29 at the Wayback Machine National Climatic Data Center'.' Retrieved 2008-06-05. ^ "Man Dies In Windstorm". The New York Times. May 21, 2003. Retrieved May 1, 2010. ^ Lane, Damon. "Colorado Dust Devil Tosses Porta-Potties". Texas Storm Watch. Retrieved 16 June 2018. ^ Lorenz, Ralph (2005). "Dust Devil Hazard to Aviation: A Review of US Air Accident Reports," (PDF). Journal of Meteorology. 28 (298): 178–184. Retrieved 17 September 2012. ^ "Dust Devils - July 9, 2012". United States Parachute Association. Archived from the original on 2017-09-17. Retrieved 2014-08-12. ^ "Skydiving instructor Tony Rokov killed in accident at Goulburn airport". Sydney Morning Herald. 22 November 2015. Retrieved 22 November 2015. ^ "Paraglider landed 180km away after being thrown off cliff by dust devil". Sydney Morning Herald. 3 January 2019. Retrieved 3 January 2019. ^ "Stalking Arizona dust devils helps scientists understand electrical, atmospheric effects of dust storms on Mars" (Press release). University of California, Berkeley. 29 May 2002. Retrieved 2006-12-01. ^ Koch, J.; N.O. Renno (Dec 5–9, 2005). "Convective-radiative feedback mechanisms by dusty convective plumes and vortices". Fall meeting of the American Geophysical Union. ^ Kok, J.F. ; Renno, N.O. (2006). "Enhancement of the emission of mineral dust aerosols by electric forces" (PDF). Geophysical Research Letters. 33 (Aug. 28): L19S10. Bibcode:2006GeoRL..3319S10K. doi:10.1029/2006GL026284. ^ "Martian Dust Devils Caught". Climate Research USA. Ruhr-Universität Bochum. March 21, 2000. Archived from the original on 2006-10-30. Retrieved August 9, 2010. ^ Smith, Peter; Renno, Nilton (6 June 2001). "Studying Earth Dust Devils For Possible Mars Mission". UniSci News. Retrieved December 1, 2006. ^ Singh, Ramdayal; Arya, A.S. (29 January 2019). "Martian Dust Devils Observed by Mars Colour Camera Onboard Mars Orbiter Mission" (PDF). Archived from the original (PDF) on 19 February 2019. Retrieved 19 February 2019. ^ David, Leonard (12 March 2005). "Spirit Gets A Dust Devil Once-Over". Space.com. Retrieved December 1, 2006. ^ "Did You Know?". Mars Exploration Rovers. Cornell University. Retrieved December 1, 2006. ^ Lyons, Walter A. (1997). The Handy Weather Answer Book. Detroit, MI: Visible Ink Press. ISBN 0-7876-1034-8. Wikimedia Commons has media related to Dust devil. Page with many movies of Martian dust devils as seen by Spirit, with enhanced images as well as ratings. This page was last edited on 2 April 2019, at 21:44 (UTC).